We had some useful rain this week. Not a lot but enough to give that spurt to the vegetable garden that only natural rain can achieve. The lawns get a lift and green up and the moisture in the ground goes that little bit deeper and is more useful to the fruit trees. Every year we try to succession plant the Rockmelons and Watermelons to spread the ripening and maintain a continuous feed rather than an almighty glut. There is an art to this which we struggle to achieve. The early plantings grow slowly as the ground and air temperatures are still a little cool. September and October brought some cool nights and mornings which slowed growth a little. In the past we planted new seeds every few weeks but the newer seeds benefited from the later season warm weather and shot out of the ground catching up with the earlier planting and all fruited together. Another year leaving the second planting too late resulted in the cooler Autumn conditions arriving and the fruit never maturing. This year the second planting is based on the level of advancement of the first planting with fingers crossed that the season will provide some longevity of warmth. We envy those gardeners whose ‘green thumbs’ bring success by magic every time. Some little time ago there was an article that mentioned the cutting of vegetables. Its location and source is forgotten and attribution not possible. This article talked in part about cutting vegetables and the variation in taste and mouth feel when different cuts are made. Whenever the same vegetable is served on successive days we try a different presentation. Julienne, diced, half rounds, rounds, chunks and whole. The incredible thing is the ‘change’ it makes in flavour. Some vegetables even have a preference. And some dishes benefit from a particular form such as stir fry seems so much nicer when the onion is cut into quarters before being separated into leaves. A certain texture prevails in the dish. Some people find carrots boring but nothing is more inspiring than a small pre-dinner serving of freshly picked carrots julienned, lightly steamed, drizzled with walnut oil and a light sprinkle of good rock salt. The sweetness of the carrot, aroma of the walnut oil and the slight saltiness balanced with a fresh white wine. Also another nice way with carrots is to grate them and serve them with some chopped boiled egg and some small pieces of black olive, add some vinaigrette. For years now we have been buying potatoes for seed from the supermarket. Only about 6 to 8 small unwashed potatoes every so often. They go into a paper bag at the bottom of the linen press and are checked from time to time for shooting. Even washed potatoes work fine. 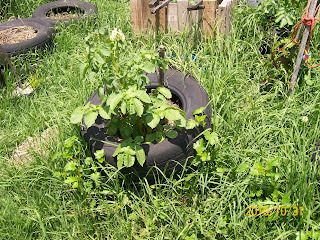 Once they have a small shoot, down goes some newspaper or cardboard, two tyres on that with the potato on the paper in the middle then a couple of spadefuls of compost from our garden waste compost bin. When a green shoot emerges and is about level with the top of the top tyre in goes a few more shovel fulls of compost leaving only a small amount of green shoot showing. When the plant grows to its full height and dies back just remove the tyres and harvest the crop. Remove the tyres with care as they may harbour snakes. This works in our climate all year round. Growth is a little slower in Winter but the tyres absorb heat and assist in the process. Placing the tyres at the base of fruit trees like citrus which are shallow rooted provides that extra little bit of food for them. For many years we had problems in the vegetable garden with Guinea Fowl and Peacocks trampling or scratching up seedlings. After trialling many protective devices, we came across a very simple solution at a friend’s farm. 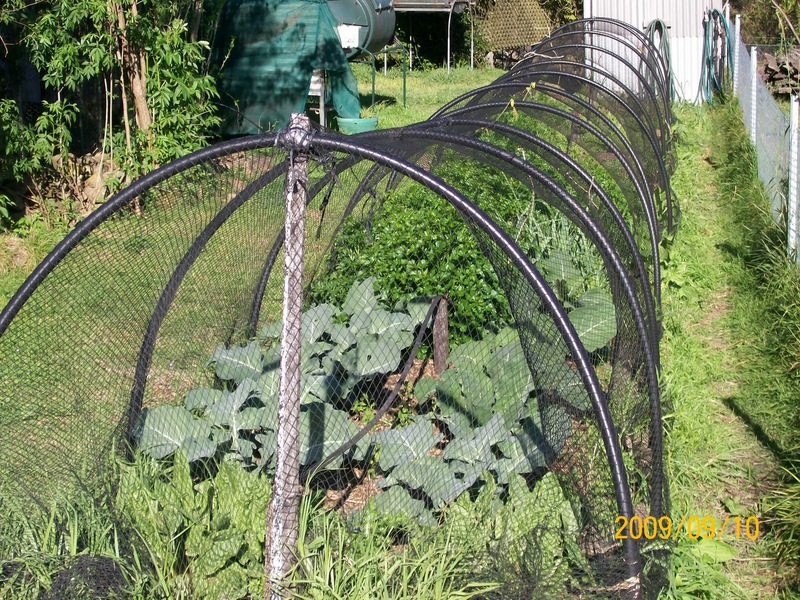 Use 25mm (or 40mm) black poly pipe bent into arches and slipped over stakes in the ground which are covered with bird netting. The stakes can be tomato stakes but they rot more quickly than steel reinforcing rod or old galvanised water pipe. The best bird netting is the good quality knitted not the cheap plastic moulded. It’s important to have a good width of netting to ensure a reasonable overhang on each side. At ground level we place a few rocks on the overhang to prevent it blowing about. The arches are joined at their peak with baling twine and each end secured to a steel post. The netting is thrown over and evened out with small off cuts of baling twine securing it at the highest point of the curve. When the bed needs to be worked a couple of pegs support the lifted netting to the high point. Black netting is less obtrusive visually than white although in recent agricultural testing on grapes white has been shown to allow more UV light through. We found an unusual pattern emerged from our change in shopping frequency. Normally we would grocery shop each week aiming to adhere to a budget. Gradually, as a time saver our shopping first went to fortnightly and then monthly. This does mean keeping a list close by documenting anything that is running low. Usually it is noted on to the shopping list as the last one is removed from the pantry store and opened. Buying only what is on the list is a critical factor. The pattern that emerged was very surprising. Our monthly shop decreased in value after a couple of months of least frequent shopping. The reduction fluctuated between 10% and 20%. Another cost control mechanism is the price comparison list. An example is below. Using a spreadsheet all the major items are listed and sorted alphabetically. Each item has its size recorded with the most recent price. A formula is used to calculate the price per KG or per each depending on the product. Fortunately recently most retailers have implemented that calculation on the shelf ticket. To save time we record where to buy the product (based on price) in the column after the product description. From time to time the list is amended, deleting or adding items depending on their significance. A copy of the price comparison list is always taken shopping. We are still not exactly sure what causes the reduction in spending. There are a few possibilities. One could be that the longer gap between purchases means opting to buy larger sizes providing an automatic economy of scale. Another idea was if you run out of an item there may be an element of substitution occurring or even doing without ie reduction in usage. Finally, the fewer visits to a supermarket reduces the temptation to add additional items to the shopping basket.